Sometimes during shader development you'll face a need to write function and frequently you'll want to explore graph of this function. You can use heavy math package or even some on-line graph plotter, but main drawback with them what you can't just paste GLSL source into them. And here is a solution: use your video card to draw function graph, this way you'll get exactly correct output with all flexibility of GLSL syntax. 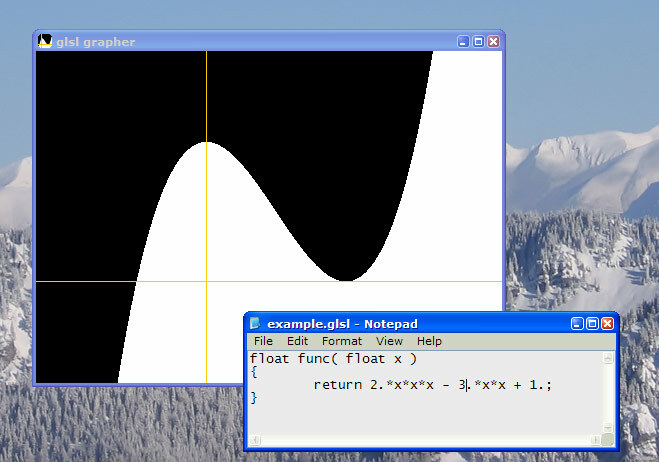 Just write your function as float func( float x ) and save to file, then open it with GLSL grapher - from command line or with it's file open dialog. Use left and right mouse buttons to pan and scale graph view. You can continue to further refine the function in your shader text editor of choice: each time you'll save your file GLSL grapher will detect it and catch-up with updated graph. And don't forget to donate if you'll like it. Without donations development of GLSL grapher will slow down.